World of Wonders is an amazing voyage through stunning images that depict life and planet Earth in its most natural and awe-inspiring form. Have you ever wondered what the heaviest flower is? Or which fish lays the most eggs? Or what volcano is the most active? The volcano discussed erupts for decades. Cool, huh? World of Wonders is a collection of the most unusual and unique animals, natural wonders, and plant and/or tree species. Each of the pages asks a question, then right below it, flipped upside down, is the answer. Below that is a detailed explanation that reveals the facts about some of the world’s mysteries. Full-page pictures of each topic enhance the experience. There are around 90 facts. Some, many readers will have learned and or heard about at some point in their lives. But there are several facts about everyday objects, animals, and phenomena that many people may have never heard about before, and certainly have never seen, which makes the reading experience a more intriguing one. The table of contents is at the end of the book, instead of the beginning under the specific questions for easy identification. 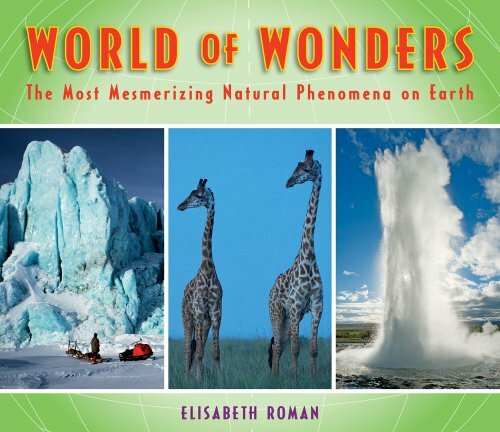 The World of Wonders is a tremendous book of amazing facts from around the world. It doesn’t focus on one topic but delves into length, distance, time, temperature, growth, age, danger, animals, caves, sand, mountains, and much more. There is a lot to learn and enjoy throughout the pages. Children between the ages of 9–12, as well as adults, will enjoy this book.